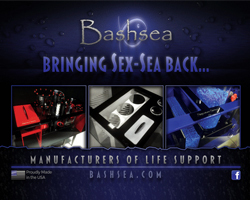 Have you ever had a piece of equipment that you thought just looked too darned pretty to be in that nasty saltwater with fish poop and gross algae? 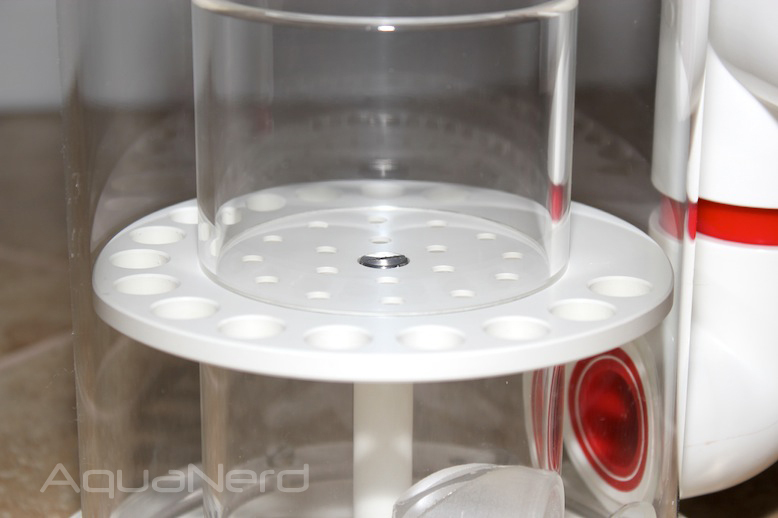 Well, such is the case for the Omega 150 protein skimmer, which Vertex so kindly sent our way. 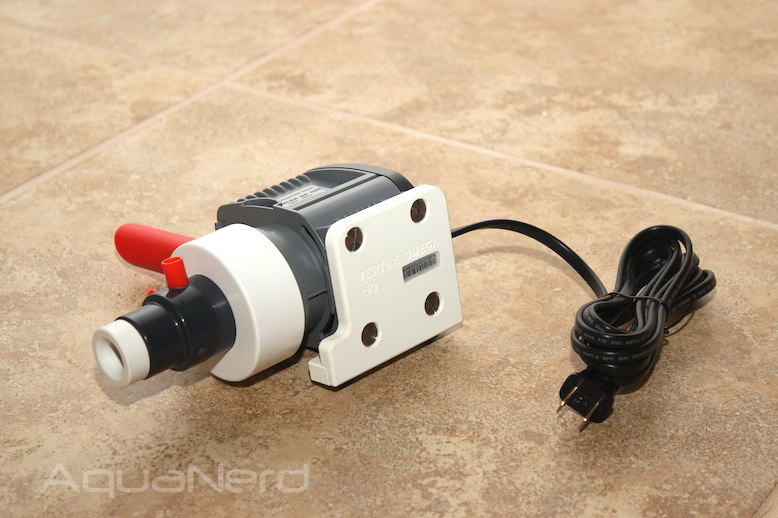 Unfortunately for the skimmer, we don’t plan on letting it stay eye candy for long, as we’ll put it through the ringer as we review it in an everyday aquarium environment. To start our review, we’ll first dive into a little product history. The Omega line of skimmers was first introduced at MACNA 2012 in Dallas, and we were told that it was meant to completely replace the Vertex IN skimmers. 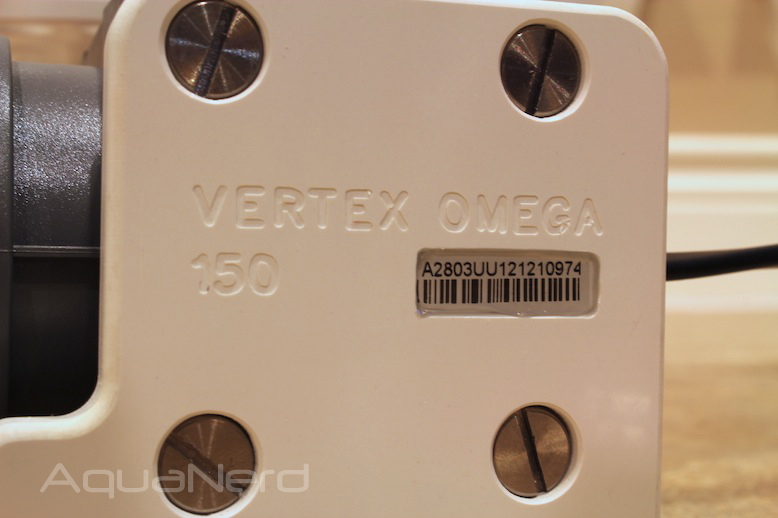 To keep its price down around that of the IN series and to better distinguish itself from the Vertex Alpha skimmers, the Omega used a Sicce pump instead of the Red Dragon. Additionally, the straight cone shape was ditched for the more elegant “whine glass” cone body. 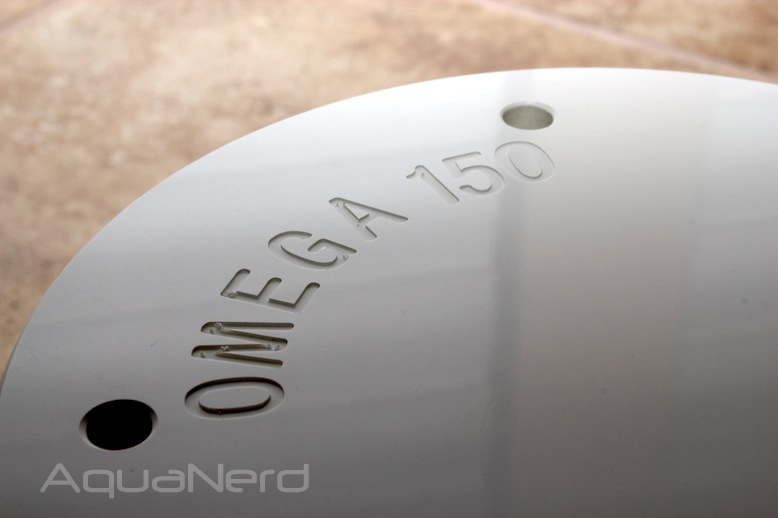 The following year, at MACNA 2013, a smaller Omega 130 was announced. 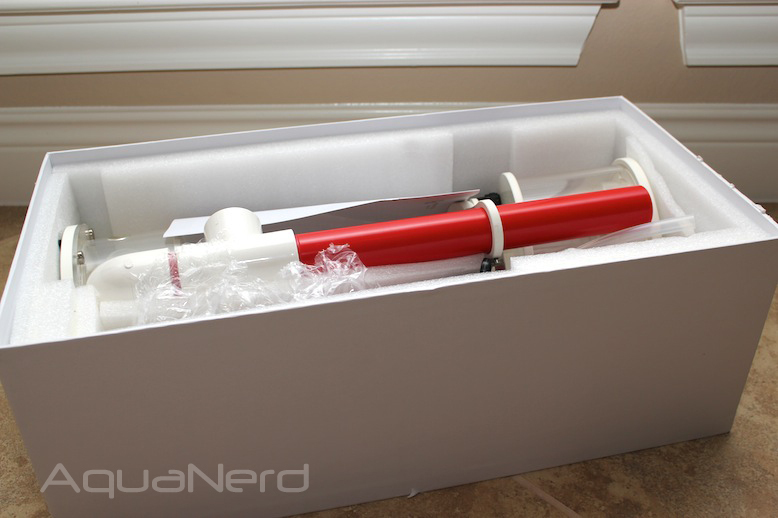 Getting back to our review, the unboxing process is always an exciting one. We carefully cut the Vertex holographic product seal on the box, slipped the lid off, and started tearing into the contents. The box, which is a simply designed crisp white container, was deceptively thick and sturdy, likely able to challenge even the most careless of FedEx or UPS drivers. To no surprise, each of the box’s contents were in perfect shape, with not a single blemish from shipping or production. 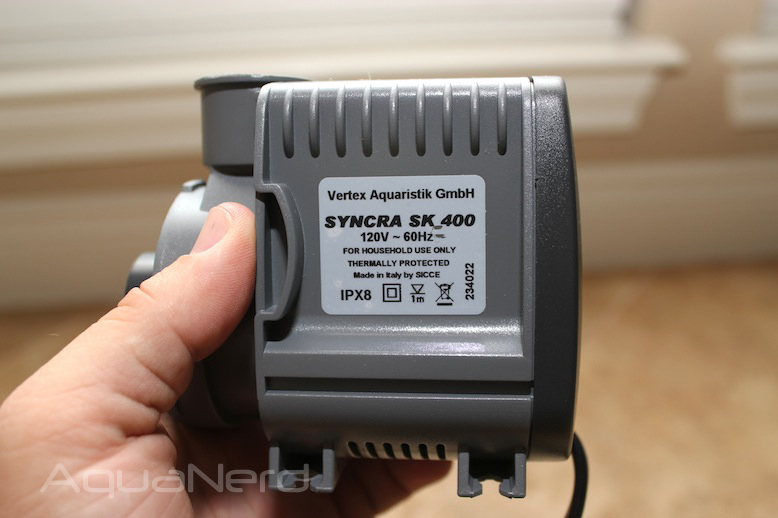 The first item out of the box was the Sicce SK_400 needlewheel pump. It comes without any of the Vertex accessories assembled to it, and we did find a wee bit of difficulting attaching the Vertex made custom pump bracket to the bottom of the pump. It was not so much an error on the part of Vertex, but our fat fingers getting in the way. Once assembled with the four titanium screws, the bracket and pump are rock solid. The bracket elevates the pump off the floor of the sump, while at the same time dampening any vibration noises with the help of rubber feet. 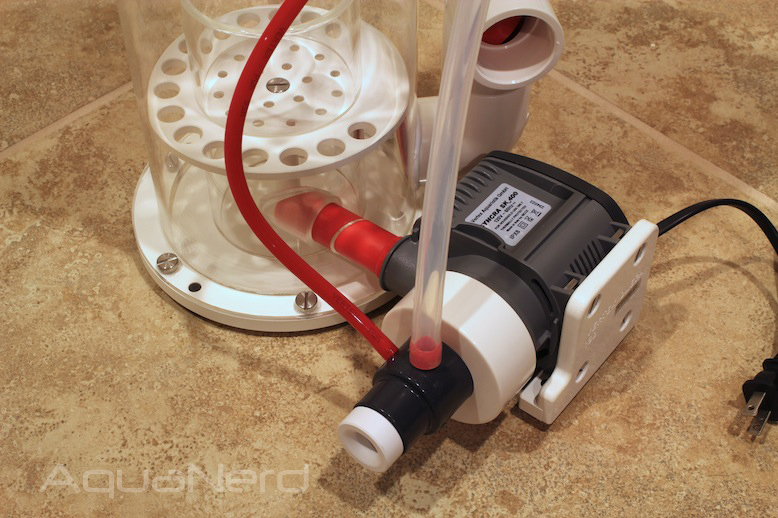 A Vertex made custom volute sits on the intake side of the Sicce pump, and has ports for both air and ozone. 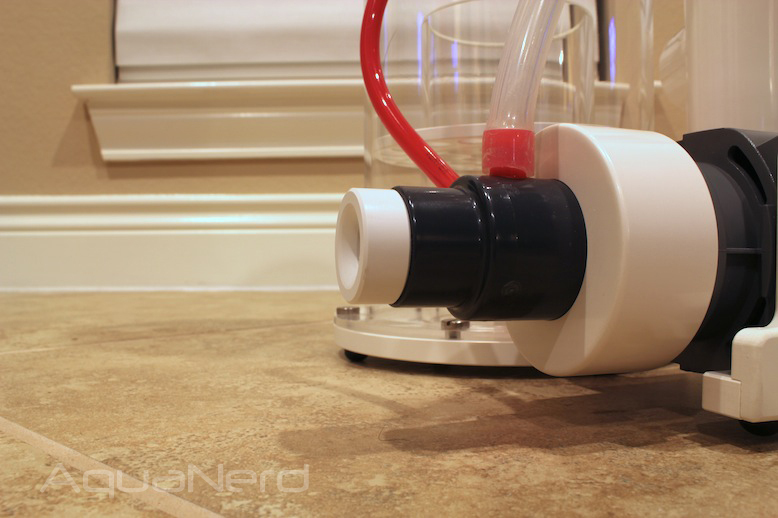 An adjustable intake allows users to alter how much air is entering into the pump. 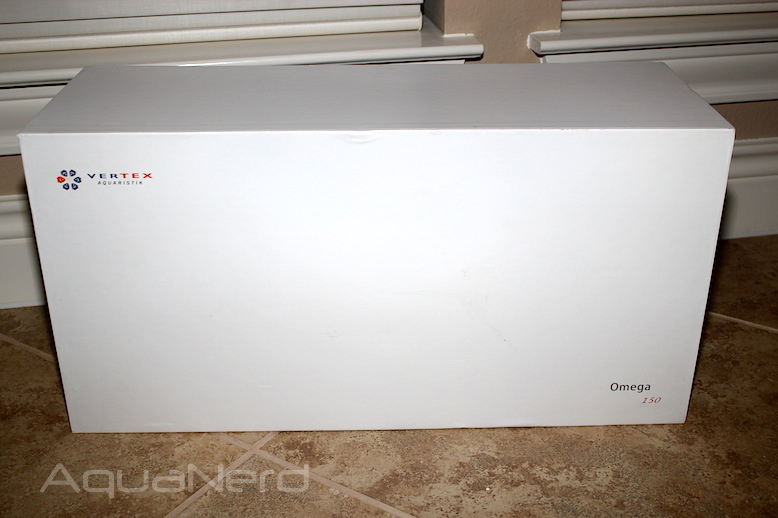 The next item out of the box was the Omega’s collection cup. The design for the cup is pretty straightforward, but even here, you can see all of the detail and effort that went into the construction process. The components of the lid are rather beefy, which is great for those accident prone hobbyists who have the tendancy to drop things. 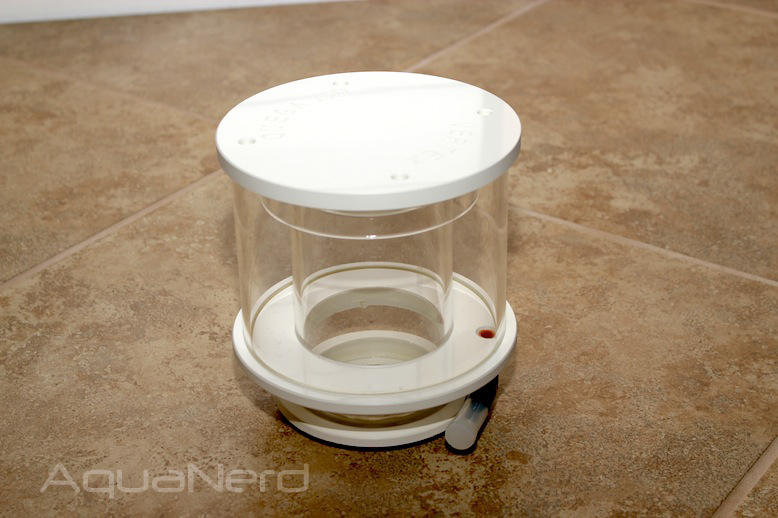 The lid, which has the skimmer name and model number are etched into it, sits atop the collection cup with the help of a groove that keep it in place. 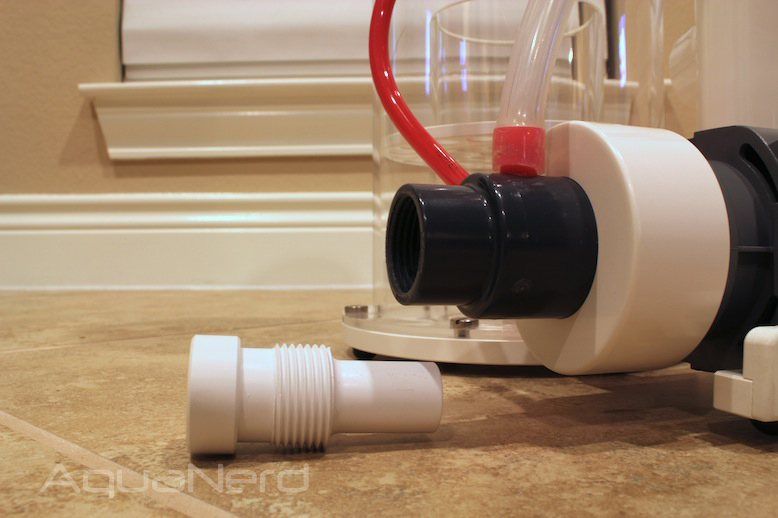 A drain line is also included, which comes with a 90 degree elbow fitting and a soft plastic cap for when it isn’t in use. The entire collectin cup screws into the body of the skimmer, with ease I might add, and it’s a feature which we love. Other skimmers on the market use twist and lock fittings or compression-like fittings to hold their cups in place, and those are often difficult to remove or reattach. Following the collection cup were all of the accessory pieces, such as the air silencer. 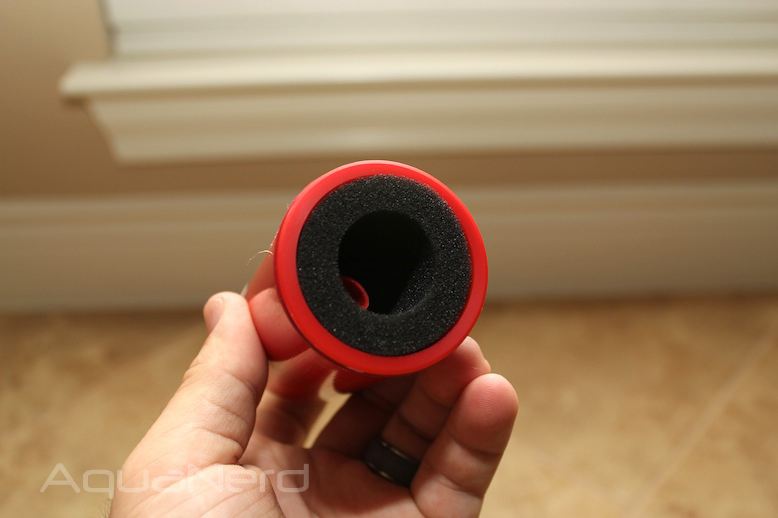 This may not be a crucial piece to the puzzle, but we love how it was lined with foam to help keep the air sucking noises to an absolute minimum. Nobody else does this, as far as we know, and it’s a great feature to have. Traveling south on the skimmer, we find ourselves staring at the bubble plate and the port for the pump’s output. The bubble plate is fairly straightforward, but it is fairly unique in that it is completely removable. 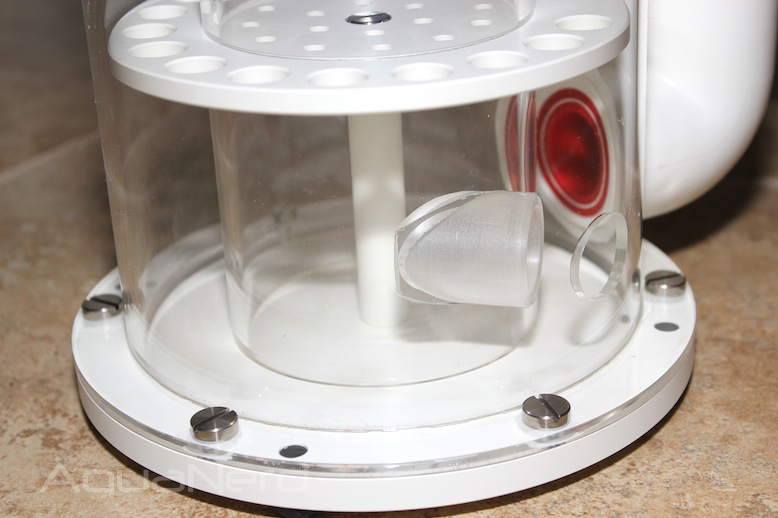 A single titanium screw holds in in place, and when it comes time to clean, the entire bottom of the skimmer comes apart making the task so easy to accomplish. 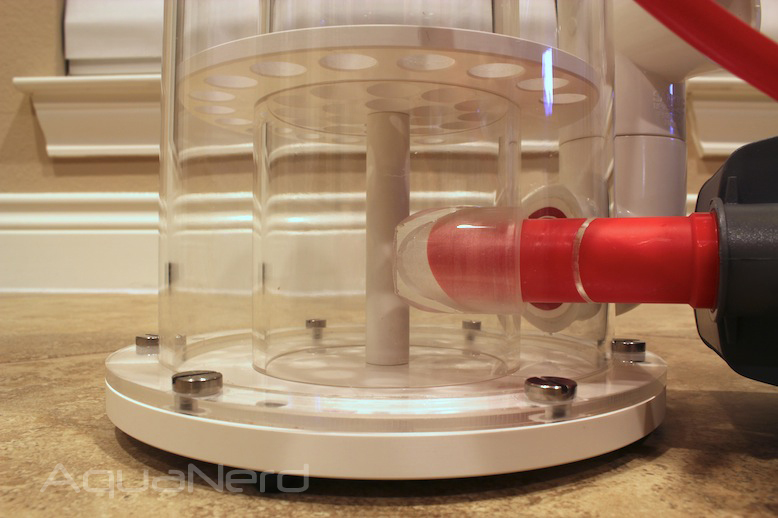 The outage pipe for the pump fits snugly into the the bubble chamber, and it’s shaped in such a way that it will only fit in the right way. Great forward thinking from our standpoint. 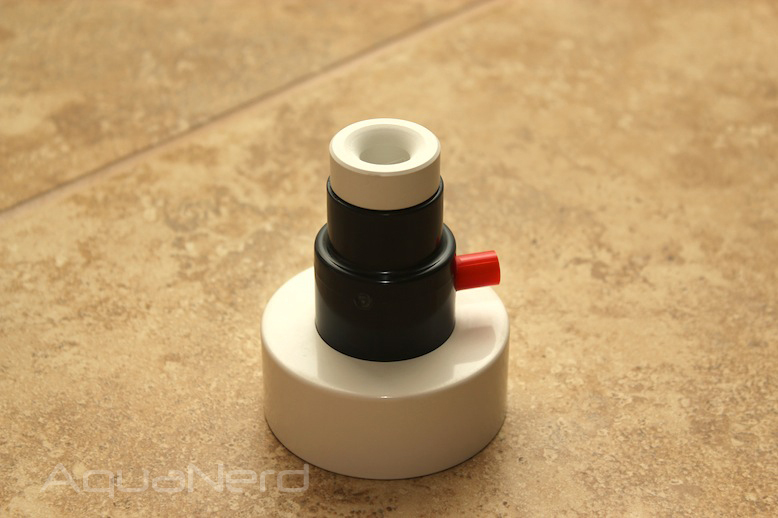 The base plate of the skimmer body, which is completely removable, has rubber feet to further lessen any vibrations that could cause an annoying humming noise. 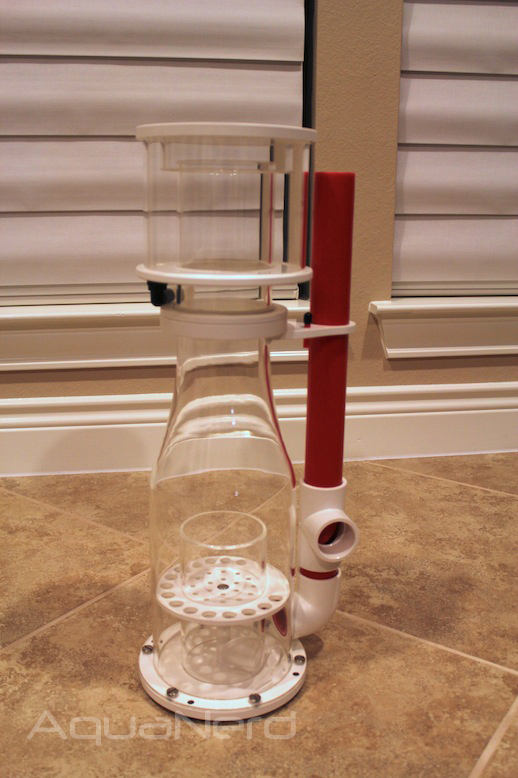 All in all, the skimmer was very easy to assemble. The directions were a little tough to read, mainly because the text was so small and a little faded it seemed, but we honestly never referred to it even once. 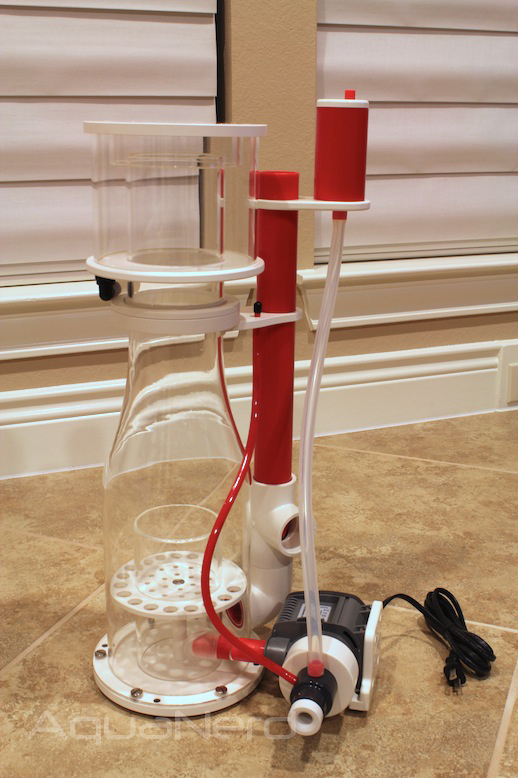 The design and build qualit is top notch, and we can’t wait to throw it into a tank to get some gunk on it. Really wondering how the noise of these compares with skimmers using a red dragon pumps. We may try one soon, but there is not a dramatic difference between these and the almost silent Alpha skimmers.